gaming | Random moosages as I see fit. I think it’s been well established that I like chocolate (and pizza). So recently, I started playing a lot of Candy Crush. Actually, that’s inaccurate. I recently started playing Candy Crush (late to the party, meh). And I’ve been playing it a lot. Mostly because I was trying to find a fairly mindless match 3 type game to help me disengage…and apparently I need to disengage frequently? Anyway, Candy Crush makes me conflicted about chocolate. If you play/have played Candy Crush, you know that the chocolate pieces spawn new chocolate pieces if the previous turn did not actively destroy a chocolate block. That means the chocolate is like an insidious disease slowly taking over your entire board. And that’s sad. Because it’s chocolate and chocolate is delicious. I don’t want to think that chocolate is a disease that’s slowly taking over everything. But then again, what if actual chocolate would spawn new block of chocolate in real life? But I don’t mean like this. Because that’s white chocolate and white chocolate is only a marketing ploy. It’s just fat and no chocolate. This doesn’t actually work. You obviously lose a minuscule amount of “chocolate” each time you do this. I’m saying, if you didn’t eat a block of chocolate one day, it would automatically generate another block the next day, assuming turns are by days. That means you could have a never ending supply of chocolate! That would be one of the best things ever. EVAR. But I wonder if this is something that happens for all types of chocolate (minus white). I mean, I don’t really want a never ending supply of milk chocolate. Milk chocolate is good now and then, but I really prefer eating dark chocolate. And I would like baker’s chocolate to have the same spawning properties. Think of all the chocolate desserts I could make! Sugh. If only…but no. Chocolate is an insidious disease slowly taking over my entire board. Yay. I should probably find another (more productive) means of disengaging. I play Animal Crossing from time to time (3DS). 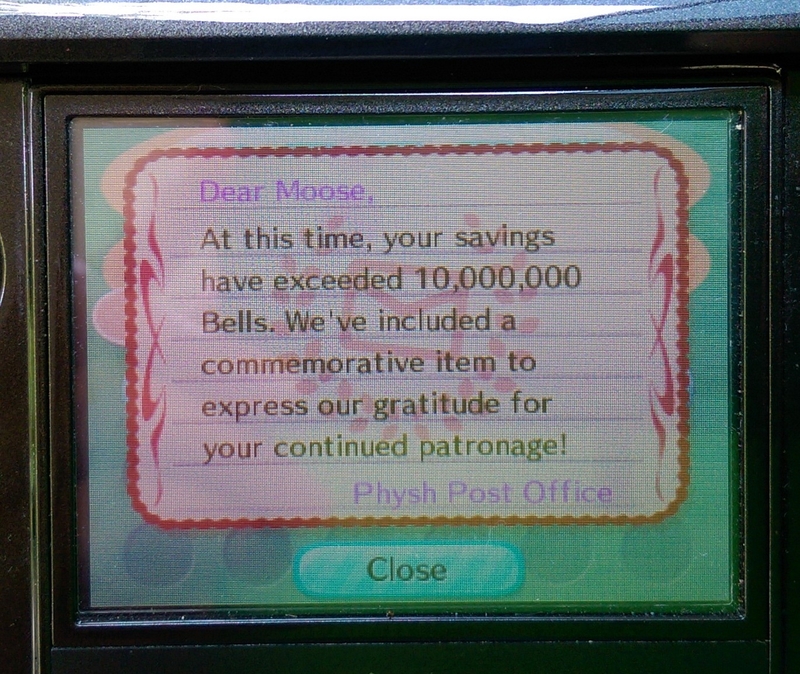 One of the times I last played, I managed to save over 10 million bells. If only there were some easy way to convert that into USD. I’m not even asking for it to be a 1:1 conversion. I might even be willing to go 1000:1 if this were a reliable way to make money.